FIPA - Publications - Why is Facial Expression Analysis in the Wild Challenging? Mean faces for some clips from the validation set of EmotiW2013 using eye-based affine alignment or fiducial point based warping. The clips are from the movies “Remember Me”, “21”, “Friends With Benefit”, and “Hall Pass”, respectively. In clip 010025312 from the movie “Messengers”, labeled with “sad” in the validation set, multiple emotions are present. 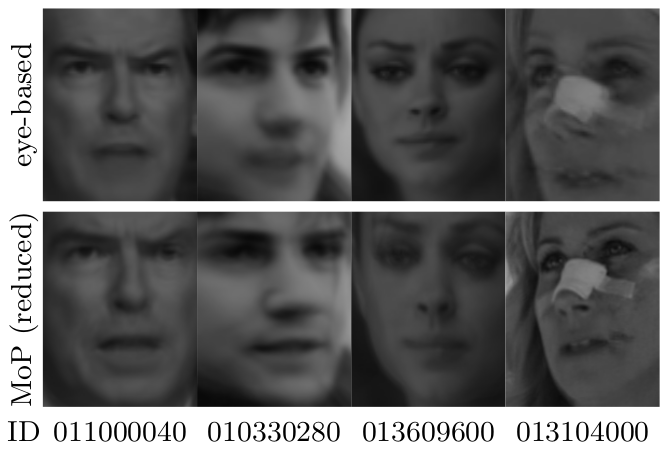 The face crop-outs depict the different prototypic facial expressions. The character’s spoken text is “You never listen to me!”.